As I reflect on all the pain and heartache in this world, I’m overcome with an overwhelming sense of grief. The physical and emotional affliction I’ve endured, since my relapse in 2012, often tempts me to slip into a slump of depression. Being isolated makes it easy to succumb to lingering negativity, douse myself in discouragement, and comfort myself with a barrage of complaints. A recent bout with constant high level pain led me to beg God for relief. I cried out for His mercy, asking Him why He wasn’t choosing to heal me. I declared my belief. I proclaimed Him as almighty, able to do the impossible, and good. I even started listing the ways I’ve trusted Him in the past. After my sobs subsided, God gently grounded me in His grace. He tugged my thoughts toward the countless ways He’d provided for me, and for others, in the past. My good, good Father had carried me through nights I believed to be unbearable. I’d witnessed Him working in and through the lives of others, as He refreshed my hope and strengthened my faith in Him. The Lord had used my personal suffering to deepen my compassion for others. And as I shared how He’d helped me, He continued to encourage others. 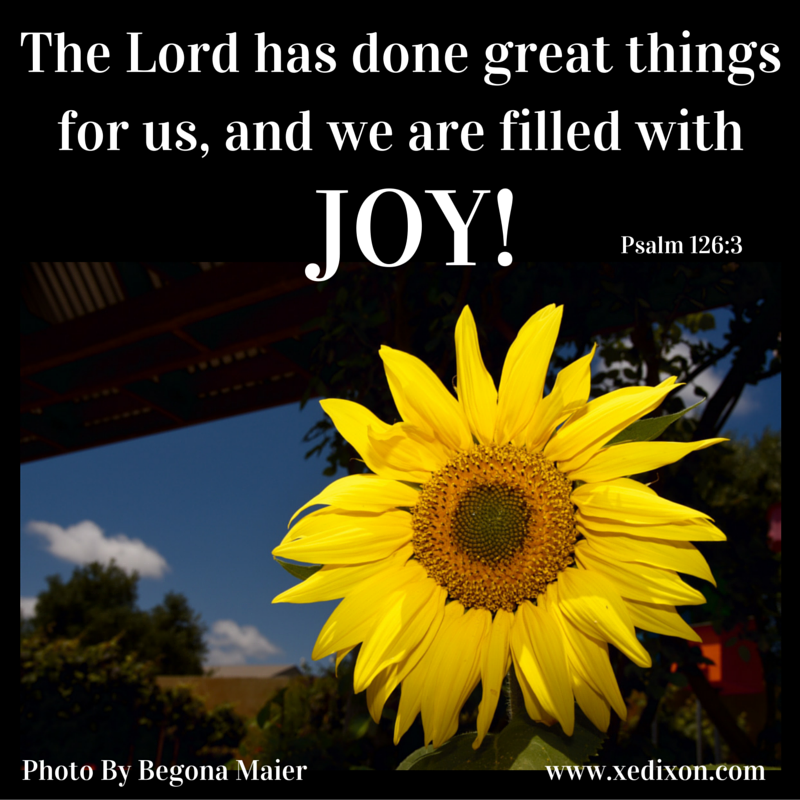 God’s faithfulness inspires our joy. His altogether goodness, dependability, lovingkindness, and generosity stir our elation. When our minds wander toward self-pity, we can list the ways the Lord has come through in the past. When our hope dwindles, we can acknowledge the ways God has done more than we could have ever dreamed of asking. When physical and emotional weariness threaten our fragile faith, we can revel in the Author and Perfecter of our faith. We can rejoice in His limitless and enduring strength. Once we ponder all the wonderful works God has done, from Creation to the cross and in His intimate intervening and sustaining power in our personal lives, clinging to negativity and despair proves pointless. We can process pain with the promise of hope and experience the joy of remembering God’s faithfulness. 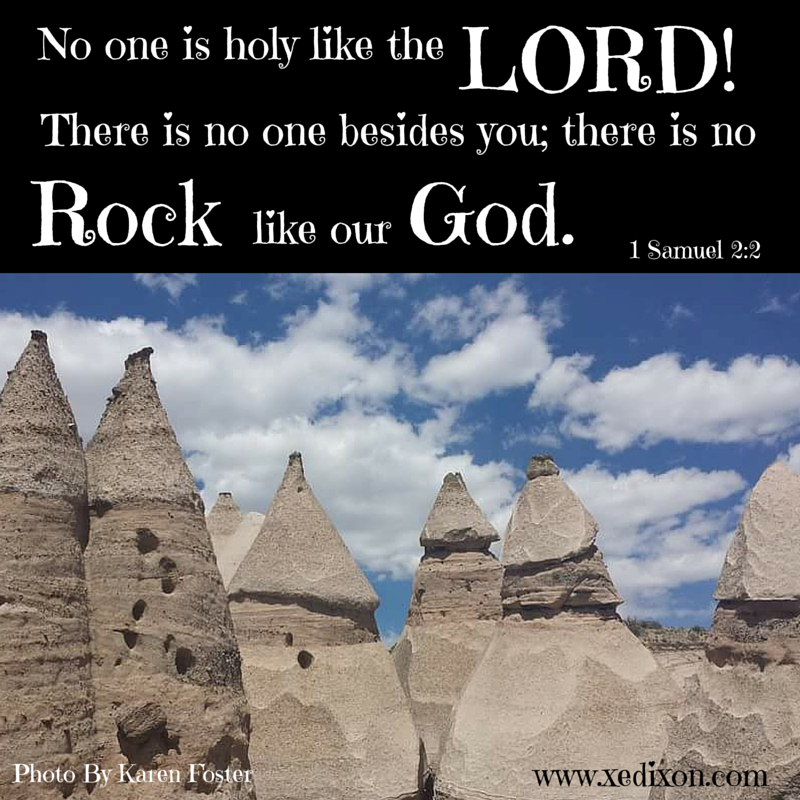 After seeing my friend’s photo of the Tent Rock National Monument, I couldn’t help but wonder at the ways God used outside elements to shape these beautiful structures. While these pretty temporal treasures intrigue me, I know of only one unchanging, eternal Rock who can be counted on to remain the same yesterday and today and forever−the constant, trustworthy, almighty God who Hannah poured her heart out to (1 Samuel 1-2). Hannah endured years of pining for a child of her own. She suffered ridicule and harassment from her husband’s other wife, a relationship with layers of drama too complex and frustrating to even begin addressing in this post. Her life wasn’t all bad, though. Hannah’s husband adored her and sacrificed to make her happy. But she wanted more. She wanted what she didn’t have, what she felt would satisfy her and make her complete. So, she made a vow to the Creator and sustainer of the world. If only God would give her a son, she would give that son back “to the LORD for all the days of his life” (1 Samuel 1:11). She set the parameters of her promise, and probably could have found another way to fulfill her son’s life commitment of service to God, without sending Samuel to live with Eli (v. 22). But Hannah trusted God so deeply that she willingly gave up the one thing she held dearest to her heart. She surrendered the dream she thought would never be fulfilled, the one thing she thought she couldn’t live without−the son she thought she’d never have. At the perfect time, God gave her the child she’d prayed for (1 Samuel 1:20). God listened to her, cared about the details of her life, and intervened in her life intimately. Yet, Hannah had to choose if her world would be wrapped up in things that wouldn’t last or in the eternal Rock−her Creator and Lord. If she would have dug her heels in and set her claws deep in an effort to control her circumstances, she would have missed out on seeing what the Lord had planned for that dream. Hannah could have never imagined what God had planned for her or Samuel. But when she submitted her dream into God’s mighty and merciful hands, she got way more than she could ever dream of asking for. Hannah got to play an important part in Samuel’s life and was blessed with five more children (1 Samuel 2:18-21). She’d asked for one son and the Lord blessed her womb with a bounty of little bundles of joy. When God is our Rock, we don’t have to settle for small dreams or succumb to the fear of risking disappointment. By giving the Lord specific requests that we’re not willing to budge on, we’re living as if we know what’s best for us. It’s as if we want to limit God with our small thinking, by being satisfied with so much less than what He wants to offer us. But when we pray with hearts surrendered to God, like Hannah did in 1 Samuel 2:1-10, we invite the Lord to overwhelm us with His generous love, goodness, and grace. When God is our Rock, we won’t need to scramble for a foothold in the crevices of temporary satisfaction. We won’t need to remain in the safe zone, hoping for circumstantial happiness that lasts only for a moment. Like Hannah, we’ll get to play a small part in God’s glorious plans when we trust Him with our dreams−when knowing Him, loving Him, pleasing Him, and living for Him become our heart’s greatest desires. Through complete surrender, we can expect to experience the joy of God’s eternal abundance instead of settling for satisfaction that sours with our ever-changing longing for something more, something new, or something else. Meme created by X. E. Dixon with photo taken by and used with permission by Karen Foster.